Even with good music blasting as I drive solo on 490, it’s still an, “I miss my mom morning.” I contemplated facebooking that earlier but decided, Nah. Inevitably one of my “friends” with the luxury of still having parents alive will sit back thinking how I need to just get over it already. Tell me about it. My mom has been dead three years June 22nd and my dad 9 years in just a couple weeks on April 15th. I wish I were over it. I’m starting to think there isn’t really an, over it. The mornings that I cry are far and few between. This was one of those mornings. It comes out of no where really. Today was intended to be a “me day”. I was excited to be going to Rochester to Trader Joe’s. The kids are off for spring break starting tomorrow so it made sense to do something for myself to energize for a week of entertaining the kiddos. As I was driving I started feeling like something was missing. I felt like I should be on my way to pick up my sister Mary and my mom like I used to. We used to get together on my “me days” and I would take Mary to work and my mom and I would would do errands together and go shopping for the day. I don’t think it was the company while shopping that I missed. It was the comfort of being with her. It was our dance. She would distract me from my worries and anxieties because I would focus on hers. I could tell her anything. She wouldn’t always understand. But I could tell her and the burden would be off me. If she disagreed with me, I could gain strength in my position by “convincing” her I was right. Thus, the “Corkins disposition” she always told everyone I had. I think I used her as a way to get strong. Which probably explains why I feel weak without her. And it probably explains why I run. As old as I am, running is my new attempt to get strong without my mom. Wow. Revelations while blogging in the parking lot of Trader Joe’s It’s hard to dance with the devil on your back. 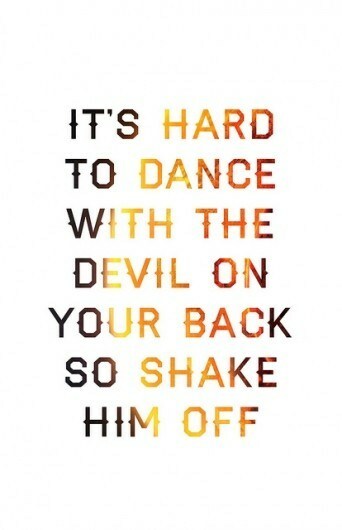 Shaking him off; for today at least.